The next day was the most enjoyable part of the trip. Heading out of Flagstaff, we made a quick stop at the local Harley shop, as both Tim and myself are Harley riders. While talking to the manager, we told him of our journey. "Well, this is Old 66 running in front of the shop." He then asked us if we've ever seen "Easy Rider" with Peter Fonda and Dennis Hopper. "Drive about 5 minutes south and look for the Pine Breeze Inn, then go watch the movie." Well, we headed down this road for about 5 minutes. On the left, we saw the Pine Breeze Inn, at one time offering groceries, conveniences and gas. Like so many other places along the old road, this one died too, and was all boarded up. We took a few photos and headed on our way. When we got back home, I checked out Easy Rider from my local video store. During the opening credits, Peter and Dennis ride up to a motel looking for a room. The old guy at the desk sees they are "hippies" and turns on the No Vacancy sign. They give the old guy the finger and ride off. The place they stopped at? Pine Breeze Inn! Back on I 40 for a bit, then we hit the longest uninterrupted stretch of Historic 66 anywhere. This took us from Seligman Arizona on to the California State Line. Our first stop in Seligman was a visit to the Delgadillo Brothers, Angel and Juan. 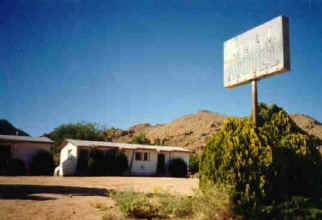 The Delgadillos are lifelong residents of Seligman. After the closing of the old road in the early 1980s, they were the driving force in getting the tourists back on the old road, and getting the state of Arizona to recognize the historical significance of the Route. This has resulted in Arizona placing "Historic Route 66" signs across the entire state. Juan's place is a hoot. Loaded full of roadside, gas station, and diner classic Americana. Be sure to have a roll of film and your batteries charged up in the video for this place, and the upcoming 160 plus miles of pristine Mother Road. After meeting Juan, if you don't leave the Snow Cap with a smile on your face, well, you just ain't right! Next to Juan's is Angel's Barbershop. Angel has been barbering for well over 50 years. He is an expert at his craft, and one of the most genuine nice people you'll ever meet. His barber chair is the same one his father used since 1929. After visiting with Angel for what seemed like ten minutes (but was actually three hours!!) I decided I needed a (straight razor) shave and a haircut. The price wasn't two bits, but it was very reasonable. Being my first straight razor shave, it was quite a treat. The man's equivalent of a women's facial. So gents, the morning before you hit Seligman, toss that Bic disposable razor and stop by Angel's. You will NOT be disappointed! After leaving Seligman, Route 66 is a sight to behold. There are plenty of small towns that still hang on, despite having felt the bite of being bypassed years ago by Interstate 40. 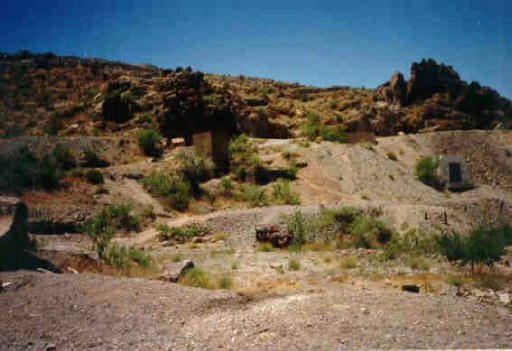 Shortly out of Seligman, you'll see the Grand Canyon Caverns, a classic must stop spot. 20 odd miles from the Interstate, still there, still great! On to Truxton, be sure to stop for a slice of pie at the Frontier Cafe. Ask the owner about her time on 66. Plenty of really great stories to be told. After Truxton, you pass thru Valentine Arizona. Be sure to note the old Indian School on the right. Just after Hackberry we entered Kingman. Tim and I broke our rule here and stayed in one of those "chain" motels. But, it had a Route 66 themed breakfast area, and certain rooms that 66 celebrities stayed in had a nice "____________________(fill in the blank) slept here". After leaving the motel, we were on to the Road to Oatman, Arizona. This was 66, and bypassed in the 1950s. The highlight of the road was of course, Oatman. Miles and miles from anywhere, Oatman still chugs along. This place used to be a gold mining town, and once that went bust, they still stayed. Tim and I partook of the old Oatman Jail, complete with the gallows. In Oatman, you'll also find the Oatman Hotel, where you can still climb the stairs and view the Honeymoon Suite of Clark Gable and Carole Lombard. Oh yeah, and the burros. Wild burros walk the streets of Oatman. These are descendants from the burros that were used during the gold mining heyday of Oatman. For a buck or two you can get food to feed the burros from just about every shop and bar in Oatman. Just one of those "gotta do" things along Old Route 66! Heading out of Oatman there is approximately twenty miles of pristine Arizona desert. Photo ops abound. Just before crossing the California line, we drove through the towns of Topock and Golden Shores. 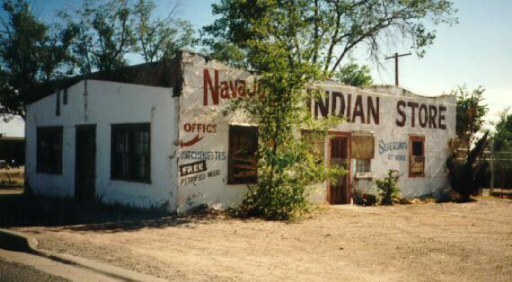 They struck me as rather new towns, with not too many sights of vintage Route 66. But, they're on 66 none the less, so that's good enough for me! Just before getting back onto Interstate 40 to cross into California, there's one final Arizona Route 66 sight to see. Tim and I crossed over the on-ramp to Interstate 40 and found the old Route 66 bridge that travelers originally crossed into California on. Now, it seems to be used as some type of pipeline-bridge, but you can still see it in it's original configuration in the "Grapes of Wrath" movie. Rolling into California, the first town we hit was Needles. By all means, before crossing the Mojave to Los Angeles, GET YOUR GAS HERE! It's a long road thru the Mojave, and if you need gasoline along the way, there's not too many places to get it. Plus, you will pay a premium price. We noted gas prices of $1.79 a gallon. The first word that comes to mind for me when describing the Mojave is HOT! It was a summer day when we crossed. With the top down on the Mustang, it felt as if the heater was on full blast. Route 66 along the Mojave offers many cool sites to enjoy for the Route 66 traveler. Goffs California consisted of a convenience store, looking as if it's been closed for many years. We went on thru Essex and Danby, noting the many abandoned businesses along the way, reminding us of a time when this highway was a busy place. Entering Amboy, we passed Roy's Cafe and took a few photos. 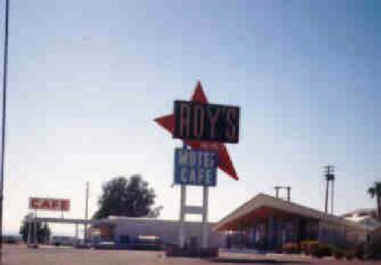 Roy's has been the scene of many a magazine photo shoot. For a view of the interior of this place, check out the movie "The Hitcher", starring C. Thomas Howell and Rutger Hauer. Look for Roy's. You can't miss it. 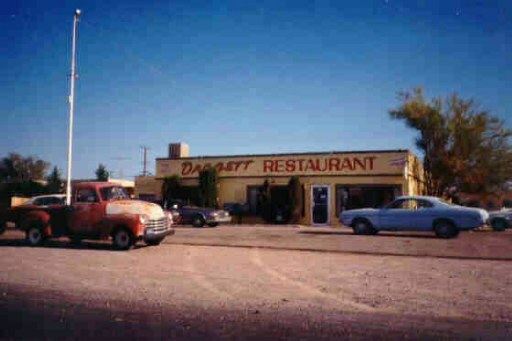 Rolling thru Newberry Springs, Ludlow and Daggett, we finally rolled into the town of Barstow. On into Victorville, we wanted to stop by the Roy Rogers Museum but had a hard time finding it. "How can I find the Roy Rogers Museum?" "This is Taco Bell, not Roy Rogers." Ah well.....after Victorville we came thru a few more towns before we decided to spend the night in San Bernadino. Being police officers from Maryland, my traveling partner and I decided to look up the local Fraternal Order of Police Lodge in San Bernadino to partake of some good company and refreshment. A tip of the hat to the members of the San Bernadino FOP - we were treated like Kings! We were up at the crack of noon the next day, and off we went to the end of the road at the Santa Monica Pier. Unfortunately, we drove the Interstate most of the remaining way, as we were unfamiliar with doing it on the old road. I'm sure we missed a few sights, but this stretch of road was fairly modern, and heavily congested with traffic. I don't know if it was a usual California day, but it seemed to be like Rush Hour on a Saturday. Our trip ended at Ocean Avenue in Santa Monica. As we were at a light just before the end of the road, I saw the famous neon Santa Monica Pier sign. Just then, coming the opposite direction under the sign, was a restored white '61 Corvette! A fitting end to our journey along Route 66! That's it! My first trip along the Mother Road. I was hooked on the old road, and continue to be to this day. I hope you enjoyed my travelogue. Check out my links below for more 66 adventures! REMEMBER - Friends don't let friends drive the Interstate!